Quesadillas originate from Mexico, and while they’ve changed a bit north of the border, they’re still one of the most popular items on any Mexican restaurant’s menu. The first quesadillas were made from folded corn tortillas. Today, we usually see wheat tortillas used for this meal. Oaxaca cheese has been replaced by and large with cheddar and other European alternatives. The spirit of fun and sharing inherent in the quesadilla’s design is one of the few things that hasn’t changed over the years. Quesadillas are one of the few Mexican dishes essentially everyone loves. Even those picky relatives who ‘don’t really like Mexican food’ can’t complain about a crispy, cheesy quesadilla, especially if they get to choose the ingredients themselves. These cheesy treats make excellent finger food, lunches, and snacks. Unfortunately, they also tend to make a mess. Cooking a quesadilla in a skillet leads to a lot of burnt cheese and a big mess. Quesadilla makers make the cooking process vastly easier. All you have to do is plug in the machine, lay out your tortillas, and pick your filling. Like any home appliance, however, not all quesadilla makers are created equal. Some leave you with warm tortillas and cold cheese, while others are almost impossible to operate without burning yourself. We’ve gone through some of the best quesadilla makers and compiled a list of our top ten to make your choice easier. Our reviews will help take some of the guesswork out of choosing between the most popular quesadilla makers on the market. We’ve compiled a comprehensive list of basic features, which includes cooking area. In this list, the cooking area/diameter feature can also be read as the maximum tortilla size the quesadilla maker will hold. Below the basic feature list, we go into depth about each product’s amenities and materials. If you’re in a rush, check out our pros and cons lists to get a snapshot of the quesadilla maker’s performance. For serious buyers, we’ve included a price and value comparison to help ensure you get your money’s worth. Cute and efficient, this is a quesadilla maker that won’t turn into an eyesore if you leave it out after lunch. Nonstick plates help keep even the cheesiest quesadillas from bonding with this appliance. A built-in drip reservoir also prevents the goodies inside from making a mess on the outside. When your food is read, the on/off light will let you know, so there’s no guesswork with cooking. Of course, a huge part of this product’s allure is its design. The pepper-shaped handle makes it almost look like a toy version that kids would play with. The truth, however, is that it’s a fully functional appliance for adults. The look wouldn’t exactly blend in with most décor, but it would serve as a subject of conversation rather than an awkward inconvenience. This product comes with a set of recipes from El Plaso to help you get the knack of measurements and mixtures appropriate for your new machine. Although this product is easy to use and enjoy, you may find yourself needing a replacement after the first three to five uses. A handy tips and tricks can prevent the biggest issues, such as closing the lid slowly as the quesadilla’s filling melts so you do not force and break the lid’s locking mechanism. That said, the most common problem isn’t something that can prevented through careful use. The nonstick coating has a tendency to flake off after several uses. It’s unclear if this can be prevented by thoroughly oiling the interior before each use, but a number of machines have suffered this problem. Eating Teflon isn’t a great idea, after all. Since this quesadilla maker costs as much more than comparable options from major home appliance manufacturers, it is a risky investment. A pretty design is only worth so much. Smart and efficient, this quesadilla provides restaurant-quality food in the comfort of your own home. Since most people don’t make quesadillas every single day, this machine features a locking lid. This enables upright storage, so it takes up much less space on your counter or in your cabinet. The unit includes both preheat and power lights, so you’ll know when it’s lunch time. 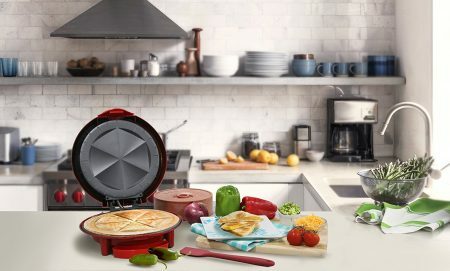 It only takes about five minutes to cook, and the quesadilla maker comes with a set of recipes to get you started with some fresh ideas. The nonstick surface wipes clean, so cleanup is quick and compact. This quesadilla maker sits near the bottom of our price range, and it competes with a few of the entries that are twice its price. The biggest problem is the handle. Although the machine works without the heat-resistant grip, it is very difficult to handle. It’s easy for users to burn themselves when the only places to grab are super hot from cooking the quesadilla. That said, this problem usually revealed itself after one or two uses. It’s a very reasonable investment, but be sure to use it frequently before the basic seller warranty ends. If you like your quesadillas bursting with filling, this is the product for you. By far the most attractive feature of this quesadilla maker is its two-setting latch. Many similar machines require delicate handling in order to close, and users have to be very careful about how much filling they put between their tortillas. This dual-setting latch allows you to make narrow, cheesy quesadillas, or big, meaty ones. It features nonstick cooking plates along with a removable drip tray for easy cleaning. A light lets you know when the machine has preheated. While the dual setting latch does a lot to make basic quesadillas easier to make, the latch still takes some tender loving care to master. It’s a disappointment, especially since this machine costs about twice as much as the cheapest items on our list. Still, those with the patience can get a lot of use out this machine, and the nonstick surface is significantly less likely to flake away than cheaper brands’. Simply be careful about overstuffing. A second latch level doesn’t make the product invulnerable, and if you put in too much, it could flood out the sides. Since this is true of every quesadilla maker, though, it doesn’t really detract from the product’s value. This product comes from a recognized small appliance brand, and its full of the special features you’d expect. This machine is built to provide the ultimate quesadilla. Each of the six sectioning areas includes a uniquely deep pocket to allow more filling and less mess. A heavy outer rim seals the edges of the tortillas together to further minimize mess and increase flavor. It’s designed for vertical storage and includes a cord wrap for maximum space saving. The interior features nonstick, wipe-clean coating. When you buy a recognized name brand, especially from a well-known company like George Foreman, you expect a product that will be a cut above the rest. After all, when you buy name brand, you’re essentially paying for confidence in the product. While this product seems to work well in some instances, there are some suspicious abnormalities. For instance, the top of the machine can crack and shatter under gentle pressure, which would make storage difficult, let alone cooking. Although the overall design works well, the components are questionable. The customer service, however, is excellent. If this sounds like an interesting product, you can trust in the customer service reps to do their jobs if anything goes wrong. Simple and hardy, this little quesadilla maker is built to last. With nonstick cooking plates formed into six deep pockets, this machine cooks quickly and efficiently. Press and seal lines help lock the gooey goodness inside and reduce cleanup time. If there is overflow, a removable drip try prevents the mess from getting out of hand. Power and ready indicator lights keep you safe and allow you to cook more efficiently. No-slip grips make the entire machine easy to maneuver, and it’s designed for upright storage. This machine is one of the rare few that does not suffer from a flimsy latch and hinge system. While it will overflow if you put in too many fillings, it’s still easy enough to clean. It also won’t snap if you put in a bit too much salsa. This product is overall more structurally sound than the vast majority of the competition, and it does well for casual, every day use. It sits toward the middle of the price scale, and it is probably the sturdiest item in its price range. It’s a solid investment. This premium quesadilla maker is designed to cook excellent food over years of steady use. This large, heavy duty machine features a nonstick interior with a built in drip tray. A power and ready light let you know when your quesadilla maker is on and ready for use. It’s designed for upright storage, too, which saves space in cramped kitchens. If you don’t know what to cook, the recipes included with this product can help you guide you through your first quesadilla, or help you brainstorm a new taste. Best of all, the Santa Fe Quesadilla Maker comes with a one year limited warranty, so your investment is safe. This is by far the most expensive item on our list. It costs nearly ten times as much as our cheapest option. That alone will disqualify it for many shoppers. After all, this appliance has a fairly limited use. It makes quesadillas, and that is all. This appliance does make them very well, however. Although it still suffers from leaks from over-stuffing the tortillas, it is much more reliable than most of the other products we’ve looked at. One of its problems, its weight, is actually a sign of quality. It shows that heavy materials, such as metal, were used in the construction rather than primarily flimsy plastics. If you really love quesadillas and you have the money to buy a top of the line product, this option should be worth the investment, especially with the warranty. A sleek mid-price model for consumers looking for midrange options. Nonstick cooking surfaces make this product easy to clean, and both power and readiness indicator lights make it to use. Temperature control is built in. While the design doesn’t stand out horribly on a kitchen counter, it also aids storage. It fits neatly in cabinets and under counters. While this product looks great, its performance is substandard, especially for a midrange option. There are far too many reports of users opening the box to find their new appliance with a disconnected or broken lid. Even more broke after the first use. The locking mechanism seems particularly vulnerable. This product doesn’t work as well as others in its price range, and cheaper products may actually out-perform it. It isn’t a great investment. Elegant and simple, this quesadilla maker may surprise you with its filling capacity. This gorgeously designed machine stands upright for easy storage, the black style blends in well with essentially any kitchen. A light indicator lets you know when the machine is on and ready. Nonstick trays limit mess, and the removable drip tray catches what leaks out. The interior design of this unit is somewhat unique, which means it handles fillings and cooks quesadillas slightly differently than the competition. Although components may not feel as sturdy as one could hope, they are surprisingly resilient. There are not too many reports of immediate breaks and damage straight out of the box. That alone solidifies this product’s place as a mid-priced product. Although any quesadilla maker will leak if you put too much inside, this one is remarkably easy to clean. It doesn’t even require the full seven minute cook time for most users’ tastes. It’s a good investment for someone looking for a reasonably priced option that will last past the first month of operation. If you’re looking to add some art to your food, and to cook your food well, the Rival QM100 can help. What makes this model stand out from others on the market is its festive imprints. They’re pretty standard, stereotypical Mexican symbols, but they are cute. Those little symbols do make the nonstick plates a little trickier than usual to clean, however. Apart from the extra designs, this appliance is includes all the standard conveniences, including power and ready lights. It stores upright for small kitchen owners. Rather than trying to seal quesadillas with one or two ridges at the edges, this product actually crimps the outer ring for best results. This quesadilla maker certainly isn’t our most expensive, but still sits well above the mid-price rank. Customers should keep in mind what they’re paying for when they buy this product. It’s sturdier than most, and it will last for years rather than months. It isn’t a flimsy build, either. However, part of your investment is going into the novelty of those little imprints. How much is difficult to say. Still, those decorative features make cleaning far more difficult, which may deter buyers looking for a quick and easy meal. All in all, however, this product is worth the price. This is the perfect appliance for those looking for something that can do more than make quesadillas. This product is designed to work as a kitchen chameleon. Five different nonstick plates allow the grill to transform into a pizza oven, a pancake griddle, and a quesadilla maker. Each plate is removable and dishwasher safe, which is a major advantage over every other product on our list. It features an adjustable temperature control in addition to a ‘ready’ indicator light. A spatula is included along with a one year limited warranty. There appears to have been a change in manufacturer, so the value of George Foreman products is dropping. While older incarnations of this same product held up against years of use, newer models usually quit within a number of months, if not straight out of the box. The advantage here is the warranty. It ensures you don’t suffer for shoddy workmanship. George Foreman still has great customer service, too. Overall, this product is a bit of a risk, and it essentially ties for the most expensive item on our list. The danger is somewhat lowered by the great customer service and warranty, but you may end up choosing another option in the long run. Our evaluation criteria help us decide which quesadilla makers are the best, even though each product is slightly different. By applying this objective list in our considerations, we’re able to separate the manufacturer’s claims from the actual value of a product. We’ll go into depth about what every criterion involves below. This is by far the most obvious of our criteria. When we look into materials and construction, we’re looking for materials that will last a long time, are less likely to break, and won’t be affected by the product’s job. In the case of quesadilla makers, this means ensuring that cheap plastic covers won’t melt or warp when the heating element is engaged. Household appliances are responsible for a shocking number of house fires, and poor construction is a key factor. The best quesadilla makers use metal, preferably steal, for the vast majority of the design. Since metal gets hot, however, and users will need to open it immediately after the quesadilla is cooked, quesadilla makers also need reliable, heat-proof grips and locking mechanisms. Substandard grips and locks contribute to the vast majority of burns users get from these machines. To prevent this, there need to be wide, firmly attached grips that one’s just snap off after one or two uses. Since these grips are often paired with the locking mechanism, it’s especially important for locks to be sturdy and made from quality materials. Unfortunately, bargain brands often scrimp on these features, and that reduces the item’s overall value. Nonstick coatings are part of our materials consideration. Since every good quesadilla includes cheese, this coating is an essential part of any quesadilla maker. If that coating starts to flake off or bubble up, the appliance’s days are numbered. It’s important to note that shipping damage usually falls under this category. If a company invests quality materials into a machine, they typically package it well. Steel is also significantly less likely to break in the mail. Because of this, any time an item arrives damaged, or doesn’t function straight out of the box, those points come out of this criterion. Ease of use covers the user experience. How easy is the product to use, and did you enjoy it? 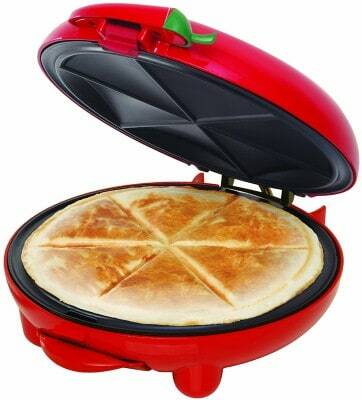 Quesadilla makers are designed to make cooking a fun, quick experience. They are not a terribly practical appliance, and they have a single, limited use. That said, they ought to perform that particular task very, very well. Anyone can make a quesadilla in a frying pan, but a quesadilla should remove all the hassle of flipping, crimping, and sectioning. If the product turns making a quesadilla into a nightmare, then it won’t do well in this category. Certain features boost a quesadilla’s ease of use score. Storage is a major concern. When space is at a premium, bulky appliances have to adapt or lose their appeal. While some people do make quesadillas every day, or nearly every day, the vast majority of users will probably only use these appliances once a week. Some may only use their quesadilla maker a few times a year. Modern kitchens are not usually as big as homeowners would like. It’s easy to run out of room. An appliance you don’t use every day will definitely need to be stored in a cabinet or cupboard. Those cabinets need to store other things, too, and unless they can store upright, quesadilla makers take up a ton of room. On/off and ready lights also weigh heavily in the ease of use category. As we discussed above, quesadilla makers get very, very hot. Since most mid to low price options don’t necessarily have an on/off switch, this light alerts users that the quesadilla maker is operating. This is important for two reasons. First of all, if you leave a quesadilla maker plugged in indefinitely, it will use a lot of electricity. The on/off light serves as a memory aid to help users save on their energy bills. More importantly, the on/off and ready lights serve as critical safety measures. The light reminds users of the dangerous temperature of their appliance before they reach for it. It also helps reduce the chance of an appliance fire. Unplugging your quesadilla maker after each use isn’t just an eco-friendly habit. It prevents the machine from overheating and scorching your counter or combusting nearby flammable materials. A beautiful, well-built quesadilla maker that easy to clean and comes with a blinking array of warning lights is entirely useless if it doesn’t make quesadillas. Core performance examines whether the product lives up to its claims by producing tasty quesadillas each and every time it’s used. The advertised size of tortilla needs to fit easily in the machine, for starters. Buying a 10” machine only to find that it is better at making 8” quesadillas is a very sad experience. Also, makers who claim their machine has deep pockets needs to be validated by user experience. Quesadillas should be hot, crispy at the edges, and have a lovely, melted filling. If quesadillas come out hot but soggy, the machine receives a poor core performance rating. On the other hand, reliable, crispy quesadillas score well. Quesadillas also need to be well-sealed. The sections should be clearly blocked out, and the outer edges need to be crimped to avoid losing the filling during cooking. The trickiest part of the core performance criterion for quesadilla makers is the question of over-stuffing. Unlike your skillet, quesadilla makers have a limited amount of space for quesadilla fillings. Even cheese can escape and flood down the sides of the machine if you aren’t careful. While it’s important for these machines to leave enough space for fillings, they also need to remain a certain size in order to properly cook the quesadillas. Many buyers are unwilling to accept this trade off. Many users also don’t understand the physics of quesadilla making. For instance, did you know that cheese expands as it cooks? This means that even though you think you put in a reasonable amount of cheese, you may be putting in far too much. Because over-stuffing is a problem for all quesadilla makers, we only counted leaks and overflows against a machine if there were rampant reports of salsa lava flows and sticky cheese oozing over countertops. A quesadilla maker should require extremely little maintenance. The interiors are usually wipe-clean, and ideally, the cooking plates are the only messy parts of the machine. We know that life doesn’t always go as planned, however, and overflows are pretty common for quesadilla makers. With that in mind, there should be as few gaps and crevices as possible for rogue cheese to hide in. Removable drip trays make cleanup vastly easier, especially for seasoned cooks who know their appliances well enough to avoid overflows. The highest maintenance scores go to appliances with dishwasher safe cooking plates. Only one item on our list has these, however, so it’s an extremely rare feature. So long as the quesadilla maker is truly wipe-clean, and the drip tray is removable, the product should get a pretty good maintenance score. Q: Why does my quesadilla maker hold so little filling? Although we discuss this briefly in the explanation of our criteria above, we’ll go into further depth to your question here. A quesadilla maker functions kind of like a mold, a cookie cutter, and a pair of skillets. Quesadillas made in pans or on griddles don’t have a mold, and they rarely have a cookie cutter, either. This gives you endless room for fillings. Even if some spill out the sides, the sides of the pan keep the mess largely contained, and it isn’t as noticeable. Most people flip their quesadillas in order to cook both sides, so the pocket full of molten filling never faces any kind of serious pressure. A quesadilla maker has a very limited space for fillings. Quesadilla makers are designed to pinch off the individual slices of the quesadilla, and they use and outer ring to try to seal the edge. When the lid comes down, the quesadilla goes under a lot of pressure. Filling on the highest pressure lines has nowhere to go, and typically gets forced out of the machine. Bigger pockets can help alleviate overstuffing woes, but quesadilla makers have their limits. If the pockets are too big, the appliance won’t be able to cook them thoroughly. There’s also the matter of pinching off sections. If the pockets are too deep, the side seals won’t be able to hold the quesadilla together. One of the best ways to get the most filling in your quesadillas is to focus on filling the pockets rather than distributing the filling evening, or simply applying it to the middle of the tortilla. This will give you an idea of exactly how much space you have to work with. Sprinkling a little cheese between the segments will help the tortillas stick together, of course, but your focus should be the pockets. Q: What do I do if my nonstick cooking plates are stickier than the manufacturer claims? First and foremost, see if you can return the item. If the return date has passed, or the manufacturer doesn’t accept used products, then try these tips. The simplest solution is to use some nonstick spray. It’s cheap, quick, and easy to use. That said, lots of people prefer to avoid aerosol cans, and some worry about how the thin layer of grease will change the flavor of their quesadilla. Quesadilla makers are all about doing it yourself, so the best way to find your ideal solution is to experiment. Coconut oil would do well under such high heat, and unlike many oils, it has a gentle, natural flavor. Keep in mind that a little oil goes a long way, though. While coconut oil and butter both do well under high heat, not all oils do. Avoid using olive oil, in particular, with your quesadilla maker. It may sound like a nice, light option, but olive oil undergoes a chemical transformation under high heat. If you’re cooking with high heat, the rules of healthy oils change. Q: Is a quesadilla maker a way to make healthy meals? The answer to this is a bit complicated. To some extent, it depends on what you put in your quesadilla maker. On the other hand, your quesadilla maker can only make quesadillas, and usually these appliances work best with standard white flour tortillas. That said, there are healthier tortilla options. And, depending on the size of the tortillas, they may have fewer calories than a comparable slice of white bread, but regular wheat tortillas aren’t as healthy as whole wheat alternatives. Think of your quesadilla maker as a kind of sandwich press. The best hot sandwiches have cheese, which isn’t tremendously healthy, either. However, certain kinds of cheese have more benefits than others. Quesadillas also have the potential to squeeze in lots of veggies and spices. Some studies show that eating spicy food helps you lose weight, so that’s a mark in the quesadilla’s favor. Still, it depends what you put inside. If you have a little cheese and a lot of salsa, that’s a reasonably healthy choice. Chicken is healthier than beef or pork. Limiting your sour cream helps, too. In the end, a quesadilla won’t be the healthiest food in the world, but by using a quesadilla maker at home, you can cook with a lot less grease, and you can choose healthier fillings. Q: What do you put in a quesadilla besides cheese? Our answer the preceding question is a good place to start. However, you can really put in whatever you want. Cheese or sour cream is necessary to help bond the tortillas together, but apart from that, you’re only limited by your imagination. Some may call it sacrilege, but you could make a tasty dessert by adding brie and apple chunks with some cinnamon and nutmeg to your quesadilla. You could also use fresh tomatoes, basil, and mozzarella for a tasty summer treat. Traditionally, quesadillas feature cheese, a bit of spice, and fresh vegetables. Meat is also a common filler. Several of the appliances we investigated come with their own recipe packs to help you get started. If you choose a product that doesn’t come with recipes, you can easily find some online. Just be careful how much filling you use. Quesadilla makers don’t have as much space as a frying pan, and you should use small portions until you know how much filler your quesadilla maker can hold. From there, the sky’s the limit!